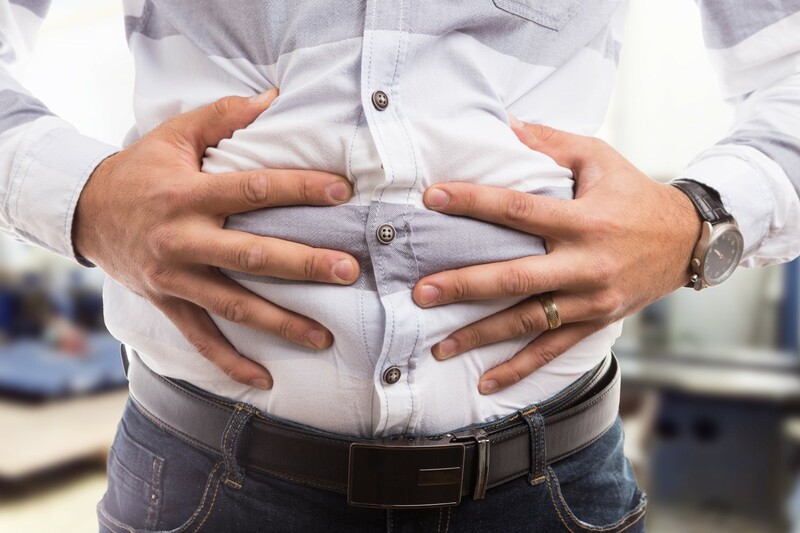 Abdominal bloating is one of the most common complaints that I hear from my patients who suffer from gastrointestinal issues. It can be due to a number of different reasons, and, by asking the right questions and doing advanced functional medicine testing, we can determine the cause and find the solution. Hydrochloric acid is produced by the parietal cells in the stomach and is responsible for breaking down food, mainly protein. Symptoms of low stomach acidity can include belching, bloating, burning, and flatulence. Bloating that occurs due to low stomach acid usually occurs shortly after eating as well and can be accompanied by a sense of over-fullness. Small intestinal bacterial overgrowth, or SIBO, is a condition where bacteria have inhabited and overgrown in the small intestine. Bloating and diarrhea are common symptoms that usually occur shortly after eating, but can persist throughout the day. People with this condition often wake up in the morning bloated. Poor intestinal motility can predispose a person to SIBO, as well as recent diarrheal illnesses and low stomach acidity. People who take antacids like proton pump inhibitors (Protonix, Prilosec, Prevacid) and H2 blockers (Zantac, Pepcid, Tagamet) are more prone to SIBO due to low stomach acidity. Food intolerances occur when your body is lacking an enzyme that specifically breaks down certain foods. The undigested food then goes through the digestive tract where it gets fermented by bacteria, leading to gas and bloating. The most common food intolerance is to lactose, found in dairy products. Other common intolerances are to histamine and fructose. Food sensitivities, like food intolerances, occur due to maldigestion that often results in excess gas and bloating. Bloating can present a few hours to a few days after eating the problematic food. In food sensitivities, there is also an immune response to the food that causes the villi in the intestine — the little finger-like projections that absorb food — to become blunted over time, which leads to poor absorption. The most common food sensitivities I see are to gluten, dairy, and soy. Your pancreas is an important organ that produces digestive enzymes, including proteases, lipase, amylase, and elastase. When the pancreas stops functioning appropriately, these enzymes decrease, and food does not get digested appropriately. Food mixed with stomach acid (chime) exiting from the stomach triggers pancreatic enzyme release, so low stomach acidity can also affect the production these enzymes. Severe pancreatic compromise occurs in conditions like diabetes mellitus and cystic fibrosis. Less severe imbalances can be due to small intestinal problems like SIBO, celiac sprue, and other food sensitivities. I’ve also seen this occur in cases of severe emotional stress. In my patients, I order a stool test that directly measures pancreatic elastase. Candida overgrowth in the intestines is a common problem I see and is often precipitated by a high sugar, simple carbohydrate diet and often follows one or more rounds of antibiotics. The yeast in the digestive tract ferment the sugars and cause excess gas and bloating. Most people with candida overgrowth feel gas frequently, a few hours after eating, but also feel it worsen when they eat simple carbohydrates like muffins, cookies, donuts, and pasta. When we eat quickly, we can wreak major havoc on our digestive system. It’s not just the lack of chewing and “inhaling” of food and air that leads to the increased intestinal gas and bloating, but also that most people on the go are not just eating — they are driving, standing, emailing, or multitasking in numerous other ways. This perpetuates the sympathetic fight-or-flight state, instead of the parasympathetic rest-and-digest state. It’s in the parasympathetic state that digestive enzymes, including stomach acid and pancreatic elastase, are produced as they should be. In fact, your digestive enzymes start secreting when you see and smell your food. So, the best ways to address bloating are to enjoy preparing your food, sit down, and chew well. Once I have obtained a thorough history from my patient, I usually can tell which of the above causes are at the root of the bloating. A lot of times, I find that people have more than one contributing factor. I frequently order advanced stool tests to evaluate for yeast or bacterial overgrowth and pancreatic elastase and/or food sensitivity testing. 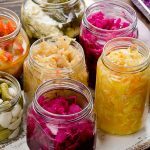 Adding digestive enzymes to a supplement regimen, as well as adding fermented foods like sauerkraut and miso, can improve digestion. Adopting healthy eating habits, such as sitting while eating and chewing well, are also initial steps to healing. 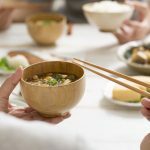 If you think that certain foods might be bothering you, learn about the differences between food sensitivities, intolerances, and allergies in my recent blog, and explore how to properly do an elimination diet to identify problematic foods.